Dr. Irays Santamaria is one of the premier dentists in Boston. She’s received Boston Magazine’s ‘Best of Boston’ award and was also recognized as a Boston Magazine 2017 Top Dentist in her field of Prosthodontics. Dr. Santamaria earned her Doctorate in Dental Medicine (D.M.D.) and her certificate in the specialty of Prosthodontics, with honors, from Tufts University School of Dental Medicine where she was also a faculty member. In pursuing her passion for dentistry, Dr. Santamaria has received the Dr. Hitoshi Ito Excellence Award from Tufts University School of Dental Medicine as well as awards from the American College of Prosthodontics. Dr. Santamaria’s practice is focused on cosmetic dentistry. She attends courses in esthetic and restorative dentistry with a focus on veneers, crowns, and implants. She has received certification in Invisalign orthodontics. Dr. Santamaria is also certified in Conscious Oral Sedation. This allows her patients to receive complete dentistry in a deep, relaxed state in just one or two visits. Dr. Santamaria’s patients enjoy a comfortable, pleasant experience with a reduced level of anxiety. 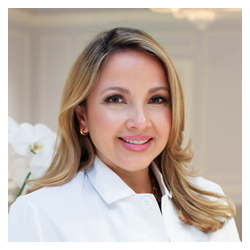 Together with her excellent staff, Dr. Santamaria enjoys making beautiful, healthy smiles for her wonderful patients. Dr. Santamaria is a member of the American College of Prosthodontics, the American Association of Endodontics, the Massachusetts Dental Society, Metropolitan Dental District, and the American Dental Association.